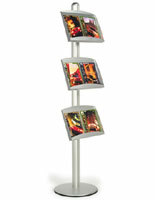 SnapFrames.com sells this brochure display stand as a double sided unit! 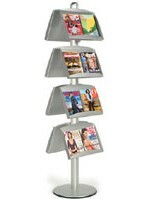 A FORTE double sided display stand such as this literature holder is a heavy duty display. 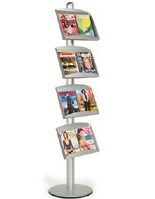 With a 73" tall pole as the backbone, the FORTE display stand is one of our larger, industrial literature displays. This particular display stand is double sided which means it holds 3 steel literature trays on either side of the unit. Each literature holder is made from fine, powder coated steel that is resistant to chipping and scratching. Fill the literature trays on the double sided display stand with 2 standard sized brochures, side by side, or larger literature. The 18- ¼" wide trays allow for custom, untraditional sized literature. 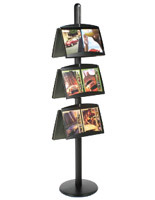 Use these double sided display stands as an information station or a "take one" display. It can even hold magazines and books for sale if you so desire! To attach the shelves, remove the cover on the top of the pole. 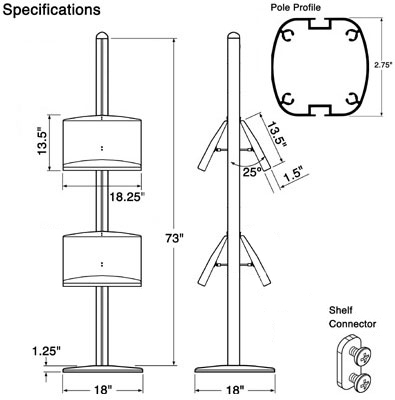 With the connectors and screws loosely attached, slide the steel tray down the groove on the side of the pole. Adjust and tighten to your liking. 18.3" x 76.0" x 17.5"